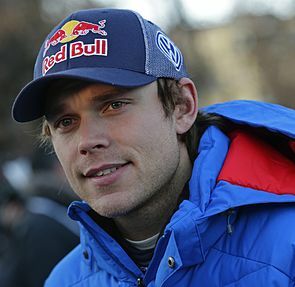 Andreas Mikkelsen (born 22 June 1989) is a Norwegian rally driver. He drove a factory Volkswagen Polo R WRC in the World Rally Championship from 2013 to 2016. He finished third in the drivers standings in 2014, 2015 and 2016, collecting three wins and 20 podiums. He currently drives for Hyundai. Mikkelsen driving a Volkswagen Polo R WRC at the 2013 Rally de Portugal. Mikkelsen has a broad background in sports. He has competed in slalom and giant slalom, and was a member of the national juniors' alpine skiing team. In 2003 and 2004, he competed in motocross, also representing the national juniors' team. After turning 17 and getting a British driver's license, Mikkelsen started competing in rallies in the United Kingdom and Ireland. Driving a Ford Focus RS WRC, he won the Quinton Stages, the Coracle, the Plains, the Bulldog and the Cambrian Rally, as well as the Saaremaa Rally in Estonia. He finished 38th overall in 2007 in the famous Donegal International Rally in his Ford Focus, finishing almost an hour behind eventual winner Sébastien Loeb. Mikkelsen debuted in the World Rally Championship at the 2006 Rally GB and retired from the 14th special stage after going off the road. In the 2007 season, he competed in eight WRC events, and also took part in the Irish Tarmac Championship and the Norwegian Rally Championship. His best WRC results were ninth at the 2007 Rally Ireland and tenth in Norway and Portugal. For the 2008 season, Mikkelsen had some exclusive coaching from Ford's retired double world champion Marcus Grönholm. Even though having major problems with turbocharger on Friday's stages, he achieved the best result of his WRC career so far by claiming fifth in the 2008 Swedish Rally, beating Matthew Wilson's 2006 record of being the youngest driver ever to score points in a WRC event. He intended to compete in all of the championship rounds in Europe, whilst completing his final year in school. During Rally Larvik in September 2009, Mikkelsen was involved in an accident, when he got a slide on his car and hit a 10-year-old spectator, killing her instantly. Mikkelsen, in the Ford Fiesta S2000, on his way to second place on the 2010 Rally Scotland. In 2010, Mikkelsen competed in the Intercontinental Rally Challenge driving a Ford Fiesta S2000 with a best finish of second on the 2010 Rally Scotland. He placed seventh in the overall standings. Mikkelsen drove a Super 2000 car also on three WRC rounds, and won the SWRC class at the season-ending 2010 Wales Rally GB. Following a strong 2010 campaign, Mikkelsen signed with the Skoda UK Motorsport team for the 2011 IRC season. During his 2011 season driving for Skoda UK Motorsport in the IRC, Mikkelsen were off to a rough start. The first rally of the season, Rally Monte-Carlo, Mikkelsen had to retire only after SS1. Sata Rallye Açores where a turning point of the season, where he placed second, his first ever podium in the IRC. Prior to the last rally of the season, Rally Cyprus, five drivers were fighting for the drivers championship. Mikkelsen, winning Rally Cyprus took home the title, being the youngest person ever to win the IRC. Mikkelsen continued his dominance of the IRC in the 2012 season, claiming the drivers championship after winning at Azores and Romania plus collecting five second place finishes. Mikkelsen is the first ever to win the IRC (now ERC) two consecutive times. From 2013 to 2016, Mikkelsen competed for Volkswagen Motorsport II in their Polo WRC. He did not reach the podium during the 2013 season, but won several special stages, placing 10th in the overall standings. In 2015, he achieved his first rally victory in Spain, followed by two more in Poland and Australia during the 2016 season. He finished 3rd in the championship three times from 2014 to 2016. In early 2017, Mikkelsen entered three rounds of the WRC-2 with a factory Škoda Fabia R5, winning the Monte Carlo Rally and Tour de Corse. He joined the Citroën World Rally Team in mid 2017, debuting at Italy with a Citroën C3 WRC. After finishing second in Germany, Mikkelsen signed a deal for 2018 with Hyundai Motorsport, joining close friend Thierry Neuville, Dani Sordo and Hayden Paddon. Mikkelsen was an Alpine skier before concentrating on rallying. ^ Holmes, Martin. "Getting to know Andreas". Rally World Magazine. Retrieved 2008-01-26. ^ "Mikkelsen beats Wilson's record". crash.net. 2008-02-11. Retrieved 2008-02-11. ^ "Fikk skrens i 130 km/t – varslet selv om ulykken". Dagbladet. 2008-09-12. Retrieved 2008-09-18. ^ Evans, David (11 November 2010). "Mikkelsen eyes title with Skoda UK". autosport.com. Haymarket Publications. Archived from the original on 13 November 2010. Retrieved 11 November 2010. ^ "Andreas MIKKELSEN". fis-ski.com. Retrieved 13 April 2019. Wikimedia Commons has media related to Andreas Mikkelsen. This page was last edited on 13 April 2019, at 17:53 (UTC).